TACOMA, Wash. -- Union activists aren't backing off demands to work at a new Washington state grain terminal after hundreds of Longshore workers stormed the facility, overwhelmed guards and dumped grain. U.S. District Judge Ronald Leighton issued a preliminary injunction to restrict union activity, saying there was no defense for the aggressive tactics used in recent days. Workers have been battling for the right to work at the new terminal in Longview. Protesters twice blocked the pathway of a train carrying grain to the terminal at the Port of Longview on Wednesday, and on Thursday hundreds of carried out the aggressive raid, police said. The dispute halted work at four other Washington ports, including Seattle, on Thursday as hundreds of longshoremen refused to show up or walked off the job. The Port of Longview was quiet Friday and Longshore workers were back on the job in Seattle. Scott Mason, president of the ILWU Local 23 in Tacoma, said some of his members have joined in the Longview effort, but he doesn't believe they were involved in illegal activity. He blamed the company for provoking the response and warned that more activity could be coming. "How long this fight has to go on is really in their court," he said. Leighton said he felt like a paper tiger because the International Longshore and Warehouse Union clearly ignored a temporary restraining order he issued last week with similar limits. He scheduled a hearing for next Thursday to determine whether the union should be held in civil contempt. "The regard for the law is absent here," the judge said. "Somebody is going to be hurt seriously." Six guards were trapped for a couple of hours after at least 500 Longshoremen broke down gates about 4:30 a.m. Thursday and smashed windows in the guard shack, Longview Police Chief Jim Duscha said. He initially referred to the guards as "hostages," but later retracted that after the guards clarified no one had threatened them. "The guards absolutely could not get out," Duscha said. "They feared for their lives because of the size of the crowd and the hostility of the crowd." No one was hurt, and nobody has been arrested -- although Duscha said that could change if police are able to use surveillance video or other means to identify the protesters. Most of the protesters returned to their union hall after cutting train brake lines and spilling grain from a car at the EGT terminal, Duscha said. They also pushed a private security vehicle into a ditch. The union believes it has the right to work at the facility, but the company has hired a contractor that's staffing a workforce of laborers from another union, the Portland-based Operating Engineers Local 701. Representatives of the engineers union did not immediately return a call seeking comment. In Seattle, Tacoma, Everett and Anacortes, hundreds of Longshore workers failed to show up or walked off the job Thursday in apparent solidarity with the Longview activists, halting work at those ports. Union leaders said they had not called for any such actions. "It appears the members have taken action on their own," said ILWU spokesman Craig Merrilees from union headquarters in San Francisco. 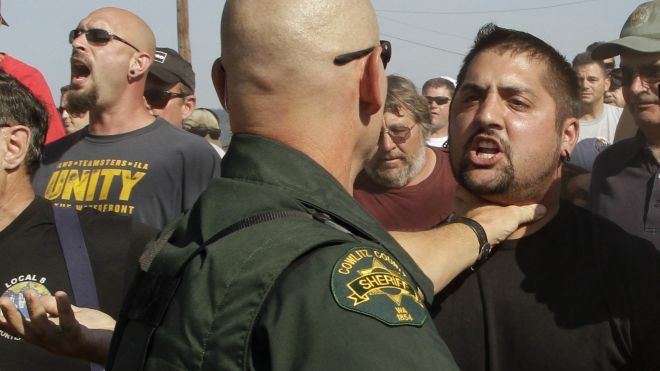 He said some workers might have been motivated by a photograph of ILWU President Bob McElrath in police custody in Longview on Wednesday. McElrath was not arrested, but an Associated Press photo showed him being grabbed by several police officers before union activists intervened and grabbed him back. Police arrested 19 protesters as they blocked railroad tracks on Wednesday night, allowing the train to finally arrive at the terminal. The protesters in Longview have portrayed themselves as being on the front line in the struggle for jobs and benefits among American workers in an economic downturn. But while union strife has flared up around the country -- most notably in Wisconsin -- the aggressive tactics seen in Longview have been a rarity in recent labor disputes. Labor activists insist that after receiving tax breaks and promising to create well-paying jobs at the new $200 million terminal, EGT initially tried to staff the terminal with nonunion workers. Following a series of protests by the Longshore workers this year, the company announced it would hire a contractor staffed by workers from a different union. "Today, the ILWU took its criminal activity against EGT to an appalling level, including engaging in assault and significant property destruction," the company's chief executive, Larry Clarke, said in a written statement. "This type of violent attack at the export terminal has been condemned by a federal court, and we fully support prosecution of this criminal behavior to the fullest extent under the law." Associated Press writers Donna Gordon Blankinship, Doug Esser and Gene Johnson in Seattle contributed to this report.